- Indian Embassy arranged help desks in Dammam, Jubail, Buraidah, Hail, Al Khafji, Wadi Al Dawaser, Hafar Al Batin, Jouf, Arar and Hafouf. While Consulate of Jeddah arranged helpdesks in the cities of Makkah, Madinah, Tabuk, Yanbu, Najran, Jizan, Qunfuda, Bahra, Bisha and Al Baha. - This all Organizations and social workers are acting as bridge between the Indian illegal expatriates and diplomatic missions. Daily hundreds of people are reaching them to take the benefit of amnesty period which is about to end on June 25. 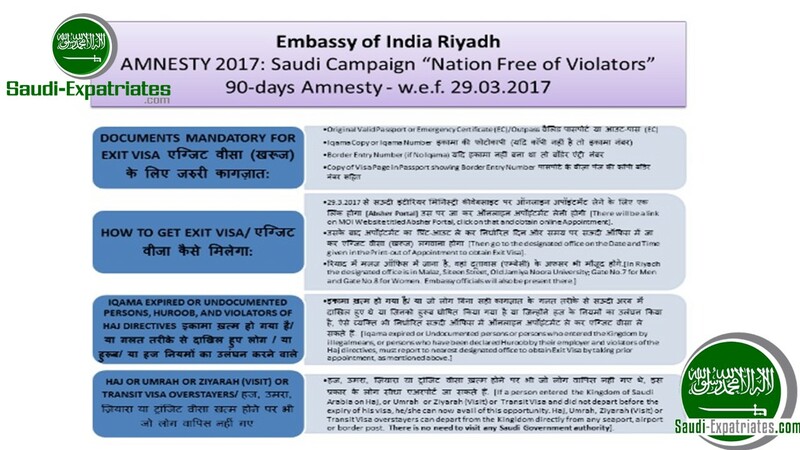 - In the first week of amnesty period itself authorities received 7000 applications for exit passes, Most of them are from Uttar Pradesh, Embassy is trying its best to open more counters because of the demand.